Mereoni Buatoka, a CMF worker was one of the many shoppers who were there yesterday to witness the opening as well as shop was happy. “I live in Samabula, this will be convenient for me especially after work, I can do my shopping here. 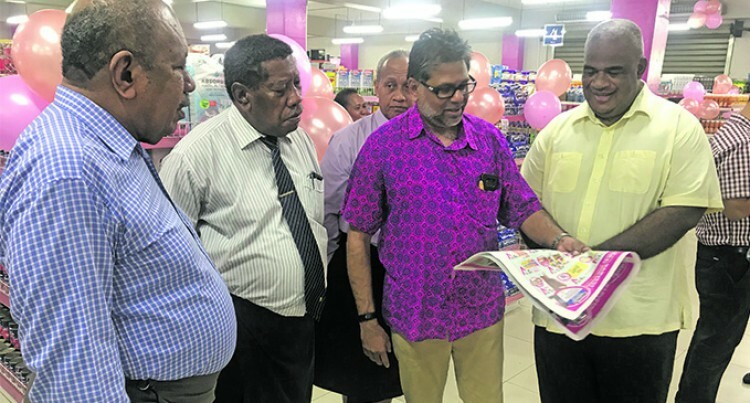 Carpenters Fiji Limited retail and marketing director Kunaseelan Sabaratnam said it started from a conversation between him and one of the church member. “This is the first joint venture between MaxVal-U and Harvest,” Mr Sabaratnam said. “We saw this supermarket trying its level best to keep up with the others but it couldn’t. “We would like to thank everybody who supported this initiative. “We had a discussion about nine months ago and today its become a reality. He said they would definitely would like to open stores in outer areas along the Kings Road, Kadavu and wherever they are not represented. He also highlighted that this was a new beginning and that the crowd at the opening yesterday is a clear indication. Altogether there are 45 staff members, he said: “We have recruited some old Harvest as well MaxVal-U employees . “We sell items from local suppliers and we negotiate in terms of buying. “Our buyers are constantly sourcing new items from overseas markets and the items are going to be very competitive and even cheaper. “So with these we reckon we can have an edge with anyone in the market in the form of pricing and we are bringing quality items. Harvest Supermarket has joined forces with Carpenters MaxVal-U to lease and operate its flagship supermarket in Kinoya under the co- brand name of MaxVal-U Harvest Supermarket. The Harvest Supermarket brand was launched in 2015 and two years into operation, they found that it was filled with operational challenges that required a different strategy, hence the relationship with Carpenters MaxVal-U. Christian Mission Fellowship International’s Global Impact Company chairman Pastor Lai Jioji said: “This signals a new business strategy on a new platform to enhance greater community participation closer to home. “The business relationship is between CMF International and Carpenters MaxVal-U. “Tapping into commercial enterprises is common around the world and CMF International has been looking at opportunities to invest in business both as a passive and active participant to raise funds that can finance its global missions operations.